Wow! What a start to the year for the Historical Fiction Reading Challenge! There were more than 150 reviews linked to the challenge during January alone! I wonder if we can maintain that kind of number each month for the rest of the year? It's a tall ask, but it would be awesome if we could! Of course, I could help by actually writing some reviews, but let's not talk about that for the moment! First for Feb is "Fallen Angel". I've now set up my own blog for reviews - Caz's Reading Room so will now link there instead of to Goodreads. Shall I now post my link somewhere else for completing the challenge? First book of February: Shadow of Night: Book 2 of the All Souls Trilogy by Deborah Harkness. Even though the first book in this trilogy wasn't historical fiction I'm counting the second book as HF due to the fact that we spent our entire time in 16th century Europe. I linked to The Forty Rules of Love on here; half of it takes place in 13th century Turkey and half of it takes place in the modern day - does that still count? If not, please take it off - I'm good with either way, I just know sometimes I seem to be more strict about what I consider historical fiction than others so I figured I'd add it. 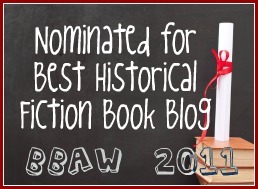 Was disappointed in my February historical fiction book, The Whiskey Rebels, by David Liss, but pleased that I am 2 for 2 in 2013! Blue Asylum-an okay book, but I think I would have preferred it if it were longer. My second book linked in February--yeah, I love historical fiction! Just read a fabulous book--The Shoemaker's Wife!! The Kingmaking-really loved this one! I can't wait to read the rest of the trilogy. Song of the Nile-really great! I can't wait until the third book comes out. February wasn't up yet when I posted this and I forgot to come back and check until now, so I've just added my HF book review from February.